My study abroad program is located in Florence Italy. I live in the city center but in a primarily residential area. Near me are markets, restaurants, and even a church. I have gone as far to explore the other side of the river which is the Arno river. Florence is a historic city. Various pushes in fashion began there and then there is the Duomo. This is only a 15-minute walk from where I am currently living. 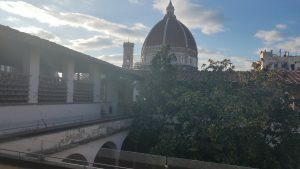 My favorite spots in Florence so far are as is and you should visit them too. The first spot is Ristorante Dino. This restaurant I found very close to me one night when I wanted a place to eat dinner. I started going there back in February and have been there at least once every week. They have a salad there with anchovy dressing that is amazing. I know it may not be to many peoples taste but it really is something good on their menu to try. Most importantly, I have become great friends with the owner. 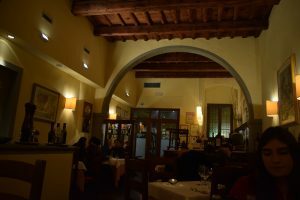 The first night I went to the restaurant and I was super excited because it was my first “real” Italian restaurant experience where I made the reservations on my own beforehand. I went in with a camera taking pictures of every dish and lots of excitement. The hostess and owner of the restaurant were very kind and bubbly and we got to talking. After that, I ended up going their again, and then again, and so on. By my third visit, the hostess decided she would teach me some Italian since I visited so often. I was able to make a connection with a local in my neighborhood and build a relationship that made me feel more at home. 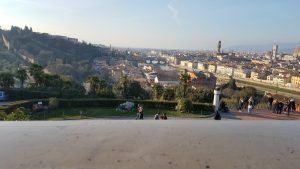 The second is the Piazzale Michelangelo. The first time I was introduced to this spot was during an activity during Orientation. I feel in love. 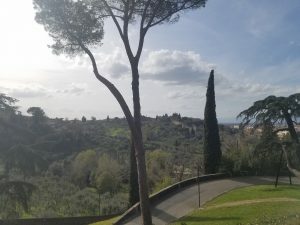 It is a short hike uphill from the Arno and has a wonderful view of Florence. It is a great tourist attraction for this very fact but I go there often because of the fresh air and I actually like to just sit, listen to music, and people watch. Plus the hike up is a nice way to get a little exercise in. Lastly, my other favorite spot in Florence is out of the city center. It isn’t in my neighborhood but I enjoy this spot a lot because it is very tranquil and calm. Every Thursday I volunteer and teach in a middle school near Talenti. There is a park that I cut through to get to the school and it used to be owned by a rich Florentine couple but when they died they left the estate to Florence and it was turned into a public park. I like to sit there after lessons. It’s only four stops outside the center on the bus right outside Santa Maria Novella Station to get there. Look out for these spots if you are visiting!